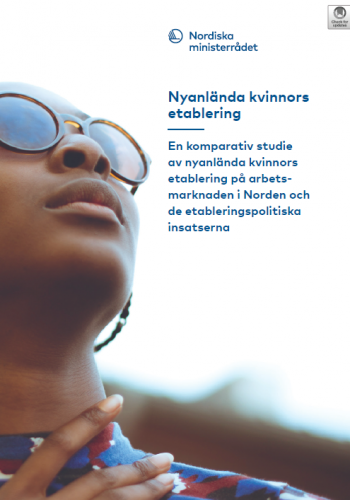 On behalf of the Nordic Council of Ministers, Oxford Research has carried out a comparative study on the labour-market integration of newly arrived women in the Nordic countries and related policy measures. Labour force participation in the Nordic countries is high. Women’s participation rate in paid work is particularly high in comparison to other countries, which is partly due to a system allowing for combining paid and unpaid labour – one of the pillars of the Nordic welfare model. There are, however, significant differences in the participation rates within the Nordic countries and in all Nordic countries, the gap in labour market participation between native- and foreign-born has grown. This development has led many to question how well the systems for labour market integration are working. For many years, the debate on labour market integration lacked a gender perspective, but in recent years more attention has been paid to newly arrived women’s situation on the labour market. It often takes significantly longer for newly arrived women to integrate into the labour market than for newly arrived men, and their employment rate often remains lower compared to men’s, as well as compared to the employment rate of Nordic-born people. The exclusion of such a large group of people from the labour market is a multifaceted problem. The Nordic welfare model is characterised by active redistribution policies, but in order to maintain high service levels, it also rests upon the premise that everyone of working age – men and women alike – participates in the labour force. A combination of demographic changes, including an ageing population, and problems with matching skills and labour market needs calls for improved utilisation of the competencies of the entire working age population. In addition to consequences on the societal level, low labour force participation rates create problems on the individual level where not working increases the risk of economic vulnerability and social marginalisation as well as mental health issues and low self-esteem. The employment levels of newly arrived women and newly arrived men are lower than those of Nordic-born women and men. Newly arrived women’s participation is, however, especially low and continues to be low several years after the term “newly arrived” has ceased to be an accurate description of their status. How can this slow labour market integration process for the newly arrived women be explained? The research suggests that individuals with a great responsibility for childcare risk falling outside the public introduction programmes. The generous parental leave systems in the Nordic countries, which usually promotes labour market participation through job security, seems to have a reverse effect for newly arrived women in several countries, weakening the women’s connections to the labour market. Furthermore, there is evidence to suggest that foreign-born women in the Nordic countries – presumably also newly arrived women – use childcare to a lesser extent than domestic born women. The reason for this seems to be two-fold: preference and capacity. Trust in the childcare system and access to childcare is vital. Easy access to childcare (short queues and affordability) and availability of childcare on nights and weekends are important to be able to undertake a job and keep it if the job involves irregular working hours. Lack of work experience and necessary qualifications is one of the most concrete obstacles for newly arrived women to participate in the Nordic labour market. Education and qualifications acquired outside the Nordic countries are not always considered valid, which results in many women having to accept jobs for which they are overqualified. Lacking the relevant language skills is also an important barrier and has proven to affect women’s chances of employment more than men’s. The mapping of the national integration measures reveals that gender-specific measures are rare. Gender equality and gender sensitivity may be included in policy documents but are hard to trace in the implementation and concrete activities. In all Nordic countries, the integration process is based on an individual integration plan. This plan is intended to be adapted to personal needs, skills and qualifications. However, in several of the countries, there is no data that allow monitoring the participation of newly arrived women in the systematised integration process. In Norway and Sweden, where such data is available, the evidence suggests that women participate to a lesser extent than men overall. Furthermore, they are significantly under-represented in activities with an explicit labour market focus. This is particularly unfortunate since such measures have proven the most effective in ensuring a transition to the labour market after finishing the integration programme. The five case studies conducted as part of this study highlight the importance of the social aspects of the integration process. According to the participants, the opportunity to exchange personal experiences and help each other to enter the labour market are some of the key benefits.